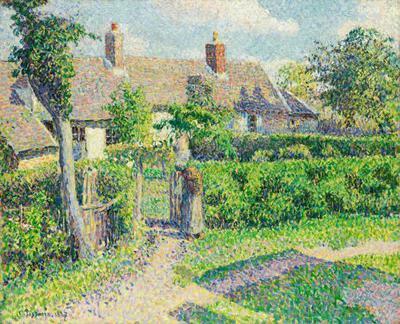 "Would Mademoiselle like scones, savouries and sparkling wine to accompany her Seurat and Signac?" High Tea at the National Gallery of Victoria Tea Room is a very stylish affair at any time, but add some French chic and artistic ambience to the event and you have a French foodie affair to remember. Peasant's houses, Éragny 1887 (Maisons de paysans, Éragny La Chaumière). Painting by Camille Pissarro. Image from NGV website. 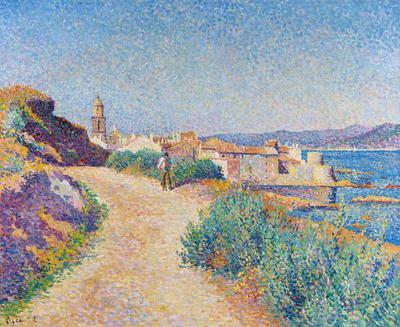 The Gallery's current exhibition is Radiance: The Neo-Impressionists. I have to admit a certain bias here as the dreamy yet vibrant landscapes and muted portraits of the neo-impressionists are among my favourite artistic works. The exhibition showcases the colourful works of Neo-Impressionism's founders and most famous exponents, Georges Seurat and Paul Signac. Other artists represented include Henri-Edmond Cross, Maximilien Luce, Théo Van Russelberghe and my personal favourite, Camille Pissarro. Until March 2013 you can revel in the light, colour and poetry of these delightful works and then top it off with a specially created high tea in the Tea Room - Radiance High Tea. We're not just talking crustless cucumber sandwiches and the occasional scone here. The food on offer is a selection of savoury and sweet sensations hand made by the tea room's very talented pastry chefs. Your Radiance package can be bought with or without a glass of the bubbly stuff but surely the whole experience will be better with some fine bubbles tickling your nose while the delectable dishes tickle your tastebuds. When: Until Sunday 17 March 2013. This special offer includes entry to the Radiance: The Neo-Impressionists exhibition, together with high tea in The Tea Room. To purchase this offer you need to contact The Tea Room before the date of your visit. You can still indulge your culinary curiosity with this special high tea without attending the exhibition, but advanced bookings are suggested. If you're unfamiliar with the works and raison d'être of the Neo-Impressionists you can read about the exhibition in Gen Wilson's article or on the National Gallery of Victoria website. It's fun to note that one of the Neo-Impressionists' most famous works, the pointillist composition, Sunday Afternoon on the Island of La Grande Jatte, by Georges Seurat features in the famous Chicago Art Institute scene from Ferris Bueller's Day Off. Watch it below and get lost in the dots. Cost: From $51 to $61 for the package high tea. Other options available.